Monster Hunter: World, Marvel vs. Capcom: Infinite, and more. Capcom has announced its games lineup and stage schedule for Tokyo Game Show 2017 in Chiba later this month. 20:00 – Capcom TV! TGS 2017 Special – Featuring Yoshiyuki Hirai (America Zarigani), Chocolat Ikeda, Ayana, The Touch (Kazuya Takuya), Gorgeous, and Jun Matsumoto (Capcom). 10:30 to 11:30 – Monster Hunter: World Special Stage – The developers provide a complete overview of Monster Hunter: World‘s living world and new game systems while playing the game live. 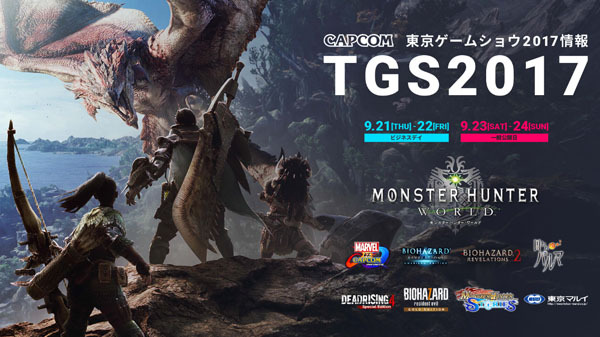 New elements and different monsters will appear every day at Tokyo Game Show 2017, so don’t miss it. Featuring Ryozo Tsujimoto (producer), Kaname Fujioka (executive director and art director), and Yuya Tokuda (director). 12:00 to 12:45 – Marvel vs. Capcom: Infinite Special Stage – Marvel and Capcom fan Gorgeous uses his vast knowledge in a battle against the Capcom development team. Featuring Tomoaki Ayano (promotion producer) and guest Gorgeous (performer). 13:30 to 14:15 – Toraware no Palm One Year Anniversary Special Stage – Toraware no Palm has welcomed its one year anniversary and new developments have begun. The latest information, including special meetings and virtual reality meetings, one year anniversary goods, and more. Featuring Yoshiaki Hirabayashi (producer) and guest Yuichiro Umehara (Haruto voice actor). 14:50 to 15:35 – Ace Attorney Series Special Courtroom 2017 – Featuring Motohide Eshiro (producer) and guest Kenn (Apollo Justice voice actor). 16:00 to 16:45 – Dragon’s Dogma Series 5th Anniversary Special Stage – Featuring Hiroyuki Kobayashi (executive producer), Minae Matsukawa (producer), Kento Kinoshita (director), and guests Hiroki Yasumoto (voice actor), Ryota Osaka (voice actor), and Raychell (singer). 10:50 to 11:35 – Monster Hunter Stories Special Stage – A talk show featuring the voice actors of Lute and Cheval from the Monster Hunte Stories: Ride On TV anime. There may even be new information about the Monster Hunter Stories 3DS game. Featuring Ryozo Tsujimoto (executive producer) and guests Mutsumi Tamura (Lute voice actress) and Ryota Osaka (Cheval voice actor). 12:00 to 13:00 – Resident Evil Special Stage – For Resident Evil 7: biohazard, this stage will focus on the newly announced Gold Edition and free “Not a Hero” downloadable content. Additionally, there will be live gameplay of Resident Evil Revelations for Switch. Featuring Tsuyoshi Kanda (producer) and guest Ruriko Aoki (voice actress). 14:20 to 15:05 – Mega Man‘s 30th Anniversary is Almost Here! Stage – In December, the Mega Man series will reach its 30th anniversary. As we look towards the nearly here memorial year, we’ll look back on the Mega Man titles released so far and deliver the latest 30th anniversary celebration information. Featuring Kazuhiro Tsuchiya (producer) and guests America Zarigani, Chocolat Ikeda, and Ayana. 15:30 to 16:30 – Monster Hunter: World Special Stage – The developers provide a complete overview of Monster Hunter: World‘s living world and new game systems while playing the game live. New elements and different monsters will appear every day at Tokyo Game Show 2017, so don’t miss it. Featuring Ryozo Tsujimoto (producer), Kaname Fujioka (executive director and art director), and Yuya Tokuda (director).